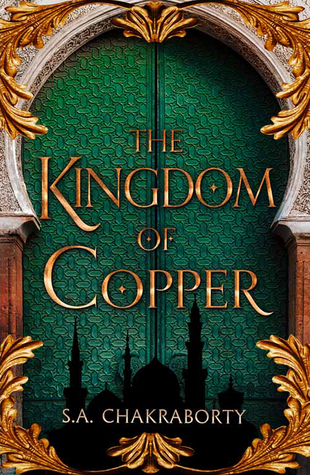 Before I wrap up this review, let’s talk about queerness in The Kingdom of Copper! This series does acknowledge queer people exist and actually has two queer male characters who are in love with each other. One of whom is Muntadhir, Nahri’s husband. I was seriously scared that one of the two would die (this was a big fear in the first book too), and I am really hoping this series doesn’t involve queer tragedy. Spoiler: ( We keep almost getting a queer tragedy. Both with the ending of the last book, and some stuff in this one. Muntadhir was about to be fatally poisoned but got saved at the last minute. I really don’t know how I feel about how the narrative keeps edging up to queer tragedy because it stresses me out. ) On another point, I think Muntadhir may fall into the promiscuous bisexual stereotype. I guess my verdict on queer rep in this series would be that it’s not terrible but also not super great. There was some cliffhanger elements to City of Brass, and the opening of Kingdom of Copper shows how they’re resolved. Ahh okay. I was just thinking they would need more resolution than that I guess. But wow I enjoyed Kingdom of Copper – this series goes from strength to strength. I feel like Dara’s supposed to be a deconstruction of the toxic love interest — like, I’m pretty sure his behavior is actually being presented as abusive. But besides you, I haven’t found anyone else who doesn’t love him. It’s so annoying! Its funny, because the author has said a few times that she’s written him to have a ton of red flags – dude’s a war criminal! And yet she’s got a ton of Dara stans out there! I know! It baffles me.